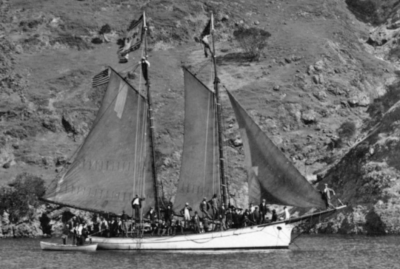 Surprise (#115499) (1876-1881), 40-foot two-masted wood sealing schooner built in Davenport, California by Henry Fritch and owned by Eugene Rogers of Santa Barbara in the late 19th century. In 1877, Captain Rogers sailed her to Guadalupe Island, Mexico with a crew of six, including George and Jake Nidever, in search of sea otters. Near San Vincente they spotted about 200 of the animals, 55 of which they were able to kill with muzzle-loading rifles. At that time, the skins brought $50 each, far short of the $500 to $1000 a piece they reached at the peak of the market. Charles Libbey was another master of the Surprise. This page was last edited on 21 July 2018, at 10:04.